My Chinese tutor is very concerned about me being hungry. No matter what time of day I go for a lesson, no matter if I tell her I have just eaten, and even if I tell her I’m bringing my own lunch, she prepares some food for me. So one week, I did the only thing left for me to do! I took her out to lunch. Today at noon, I asked my Chinese teacher to go to out for lunch. Before I went to pick her up, I did many things. I think I have exercised enough for today. When we got to the restaurant, I ordered a hamburger, French fries, and strawberry lemonade. I accidentally spoke in Chinese to the waitress. She laughed and probably thought it was good fun. My very good teacher only ordered chicken salad, but it was a very large amount. Other visitors might feel feel they have arrived in another country. My hamburger was too big, I couldn’t finish it. I will take the leftovers home. After we ate our fill and left the restaurant, I still went to buy chocolate to be dessert. My husband went on a business trip, which makes me feel a little lonely. When my husband is out of town on business, chocolate gives me comfort. When we were at See’s, the chocolate store, we ran into two young people who were from Taiwan. They work at the same company as my husband. 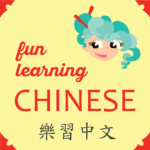 Have you had the courage to speak Chinese with a stranger? There is always the opportunity for interesting things. 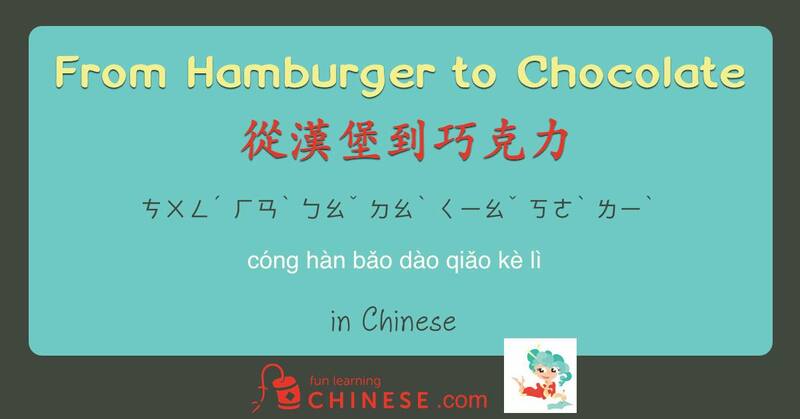 ❶ Whereas in English we say we “take someone out to eat,” that implies the wrong thing in Chinese. But you will notice later that I do “take” my leftovers home! ❷ Just like the last sentence in the blog Happiness Makes You Sweet 幸福讓你保有甜蜜 in Chinese, 之 is equivalent to 的 here. It means that what comes before it describes what comes after it. ❸ In the dictionary, you may also see 英里 for “mile,” but my Chinese tutor says that adding the 口 particle in front helps to distinguish it from kilometer. ❺ You could also say 檸檬水 for lemonade. Notice that the first two characters here are the same as in the sentence, meaning lemon, but the last character 水 ㄕㄨㄟˇ (shuǐ) means water. So, literally lemon water. ❻ This is a “sound” word, meaning that characters have been found to make it approximate the word salad from the original language (which in this case is English via Latin and French), but the characters themselves probably have nothing to do with the meaning. In this case, this is definitely true, as 沙 means sand or gravel and 拉 means pull or drag. ❼ The ㄈㄣˋ (fèn) here can also be represented by the character 分. And the character 量 with the 4th tone means it is being used as a noun, but if 量 is used with a 2nd tone it becomes a verb that means to measure. ❽ Another Chinese word that means lonely is 孤獨 (see vocabulary list), but it has more severe connotations of isolation. 寂寞 has more to do with temporary feelings. ❾ This word is doubly interesting, as it is made of two characters used previously in the blog. Can you find them?